1. นาฬิกาตาย /naa-lí-gaa dtaai/ The watch is broken. เค้า /káo/ is a personal pronoun for ‘I’ used with a close relationship. 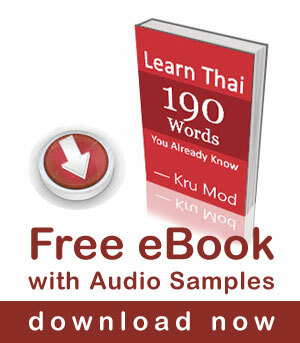 Click here to learn more about Thai personal pronouns. เอง /eeng/ is used in the pattern : do something + เอง /eeng/. It is used to convey the meaning of doing something yourself. 7. It’s a new day! To ask what time something happens or happened กี่โมง gìi-moong? is used. กี่โมงแล้ว gìi-moong láew? What time is it? รถออกกี่โมง rót òrk gìi-moong? What time does the bus leave? How do you say seconds? like 11:45:35 ? Sawadee krap, pom mak jak prathet philippin, and I love this lesson… Very easy to learn, sanook ma krap. Sawatdee ka Jeremiah, thank you for visiting my website and your message. I am happy to hear that you enjyed this lesson. Hope you continue to follow my lessons in the future as well. Kop kun ka. Hi mod!Thank you for your wonderful lesson, i’m really lovin’ it. and i’m confused about one expression. what should i say”6:30 am” and “6:15 pm” in thai? Thanks for the lessons khun Mod! I agree that your lessons are helpful, easy and fun to follow along with. The time has been a problem for me but I think I’ll spend a day on this one and see where it goes from there!! Thanks so much for all your work! Thank you so much for explaining how to tell time in Thai. You were very helpful! I am going to be in Thailand in September and I can’t wait to tell someone the time in Thailand! Thanks. The best explanation of Thai time telling I have heard. Hi, after your sister tells you 4 AM, your response to her was written as “next time you better have to go” which doesn’t really mean anything. It looks like you were telling her she’d be better off not even returning home. Is that about right? Thanks. Your lessons with conversations like this one are very helpful. Thanks again Mod for a very clear explanation of telling Thai time. Khop jai maak ka Kru Mod. 😀 Aside from being suay maak, you teach geng maak maak. I’ve always wondered about Thai time. Thank you sooo much for your fun and easy way of explaining this. I always click on your YouTube page, since I’m a subscriber. Chan siia jai maak jing jing praw mee bpen haa. (Was that right Kru?) Anyways, stay beautiful and happy always. Learning PasaThai with you will always be enjoyable. Thank you for your kind words. I am happy to hear that you found my lesson useful. Hi, Mod, I like the way you teach in your video so I like Pa sa thai. Hope to see you more in your web. Hope to see you in person someday too, Kuo Khun Krap. Kopkorn maak! learning a little everytime and happy to see myself improving my very basic Thai. Hi Mod, thank you very much for the lessons. I have read many Thai books and listen to many tapes about Telling Time in Thai but found them difficult to understand. Now, just by listening to your video, I could very well understood them. You are a great teacher, Mod. Keep it up and hope to learn more from you in future. Hi Mod, your video is awesome,please do more lessons like this in future. Hope your problem will solve a.s.a.p. Sawatdii krap Mod , Khoun pen phét souûay thiisoùt khoong thawîip aasiaa !!! Thank you Mod for this role play with your funny sister =) If you can, please do more dialogue like this, it’s really useful! I have just a suggestion! Is it possible for you to put some exercises, drills on your website? By the way, I love not just like, the way you are teaching. With a permanent lovely smile! Thank you for this lesson Khun Mod! I was always confused about telling time in Thai but you explained it very well. I think I just need to watch the video again and study my notes and I got it!